We also transplanted 1 kale and 3 strawberry plants. Unfortunately, the 1 kale didn't take but otherwise everything else is thriving. 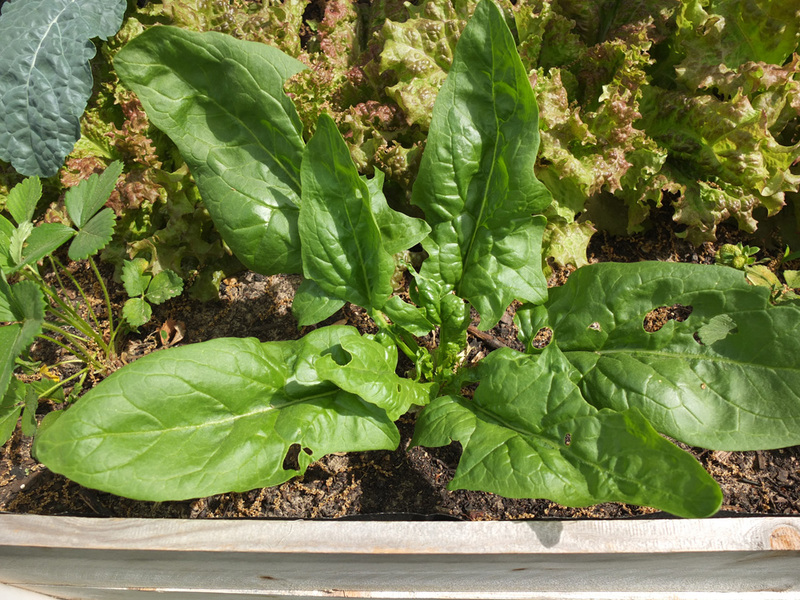 Right around Easter, we were able to start enjoying fresh salads of spinach and the lettuces. Shortly there after the kale was ready. I have been taking the outer leaves of the plants which has kept them all producing (you can also cut off the whole head). We eat salads at least 5 times a week and while not quite there yet, the garden is almost at the point of producing more than we can consume. The PC framed bird net is a new addition and a big improvement over our makeshift solution last summer (see this post). We went back and forth on how tall to make it and ended up deciding on 3 feet from the top of the planter to have room for tomato plants. The cage has worked in terms of keeping birds and rabbits out although it hasn't prevented the bugs from entering. About two weeks ago, I started noticing holes in the spinach and then the kale plants too. I thought maybe they were caused by flea beetles but after taking some leaves to the farmers market last night and asking around I think they are caterpillars. Any readers have problems with caterpillars in their gardens? Its not causing too much of an issue so I am not sure if I will try to do anything about them but I would love to hear tips from more experienced gardeners. We are thinking we have about a month left of harvesting our spring garden before it gets too hot and the lettuces turn bitter. Once this happens our plan is to do a summer planting of tomatoes, herbs and potentially some other yummies. Lessons learned so far are that doing a spring planting is definitely worth it, all plants need to be spaced further apart, we need an organic anti-bug solution such as row covers from the get go and to plant a few less lettuces. Stay tuned for more updates!